Gadgets, they are everywhere. From your TV to your gaming console, set-top box, sound system, AC units, and more, there are more and more things in our houses that need a remote control. Some of us manage to live with that mess, but others just want one gadget to rule them all... and then some. After all, we also need to control the smart lights, the thermostat, and the smart plugs, don't we? For you and me, there's a new deal up on Best Buy for the Logitech Harmony Ultimate Home. First, let's get something straight: this is a discontinued model. A couple of years ago, it was the top of the line Harmony remote, offering both IR control of up to 15 devices and WiFi/Bluetooth connectivity for your smart gadgets. It can also control devices behind closed cabinets, has a hub to reach more of them remotely, an Android or iOS app that frees you from using the physical remote and lets you set up automations, and Alexa integration. Oh and it works with IFTTT and SmartThings if you want to integrate with Google Home. However, the Ultimate Home was replaced by the Elite, a device with nearly the same specifications, except for two differences as far as I can tell: the button placement is different and seems more comfortable since it has no buttons above the touchscreen, and it can be programmed from the app without the need to plug into a computer, which is the case for the Ultimate Home. The rest of the specs appear to be the same from my research. With that out of the way, let's talk dollars. The Ultimate Home used to cost $349.99 but is now down to $149.95 at Best Buy for one day. The last time we spotted a deal on this model, it was $200. That's a nice discount, but it's even nicer when you consider that it's going for $185 new on Amazon and that its follow-up, the Elite, is still priced at around $323 on Amazon right now. Are the two improvements I mentioned earlier worth more than double the price? 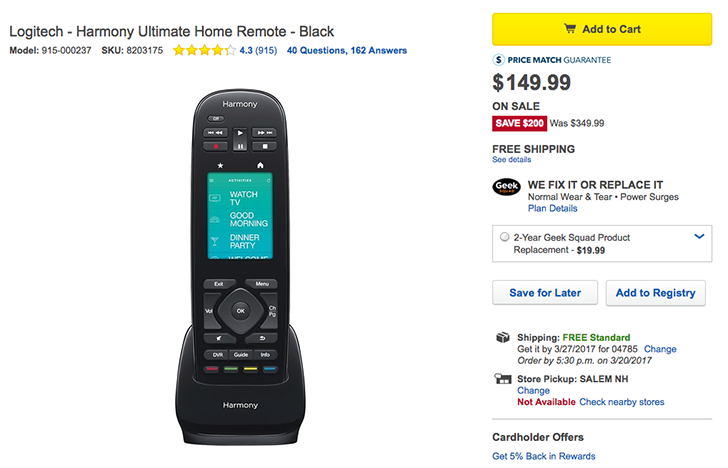 That's for you to decide, while also keeping in mind that the Ultimate One, the nearly identical remote that doesn't come with a hub or mobile app or Alexa integration, still costs $153 on Amazon. If you're interested, head over to the source link below and make up your mind fast. As we said, this deal seems to only be valid for a day.